Burberry Group Plc, (BRBY) the U.K.’s largest luxury-goods maker, reported quarterly revenue that beat estimates as shoppers spent more through digital channels. The shares rose as much as 7.2 percent, the most since July, after Burberry said retail revenue advanced 14 percent to 528 million pounds ($866 million) in the three months ended Dec. 31. Analysts predicted 518 million pounds, according to the median of 12 estimates compiled by Bloomberg. Burberry’s outperformance contrasts with comments by Italian suitmaker Ermenegildo Zegna SpA, which said last week that October and November “were not good months overall.” The luxury-goods sector expanded 2 percent in 2013, the weakest pace in four years, as unfavorable currency swings weighed on growth and demand softened in China, Bain & Co. estimates. “This is a strong performance in a slowing sector,” Allegra Perry, an analyst at Cantor Fitzgerald in London, said in reference to Burberry. The stock was up 5.2 percent at 1,546 pence at 9:42 a.m., giving the London-based trenchcoat maker a market value of 6.9 billion pounds. Sales at stores open at least a year increased 12 percent in the quarter. Investment in areas such as service and collect-in-store helped digital sales outperform, compensating for weak shopper numbers in its boutiques, Burberry said. Outerwear and large leather goods contributed about half of so-called mainline growth, the company said in a statement. Comparable sales gained by at least 10 percent in the Asia-Pacific region. 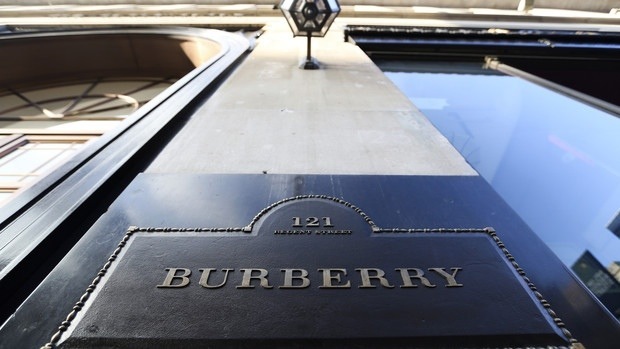 Burberry is “achieving strong returns on its digitally focused marketing, whilst supply-chain improvements are enabling competitive service levels,” said Fraser Ramzan, an analyst Nomura in London. Burberry doubled the number of orders it dispatched year on year after bringing fulfillment in house, Burberry Chief Financial Officer Carol Fairweather said on a call to reporters. Online accounts for “a little bit” more than 5 percent of sales, she said. Sales to tourists increased in the last three months of 2013, according to Fairweather. “That is very much underpinned by the Chinese luxury traveling consumer,” she said. If the current sterling-dollar rate persists, “we think that will adjust our profit by 5 million pounds through the rest of the year,” CFO Fairweather said. Burberry is targeting a “modest” increase in full-year retail/wholesale operating profit margin, it said today, repeating a forecast made in November. Ahrendts will join Apple Inc. later this year. Burberry’s creative head Christopher Bailey will succeed her as CEO. Posted on January 15, 2014, in #international, #luxury, #retail. Bookmark the permalink. Leave a comment.